The Inscribed Vishnu Temple is one of the many temples found in Hampi. It is located behind the famous Vittala temple complex that stands in the north eastern part of Hampi, near the banks of River Tungabhadra. The temple is among the lesser known shrines in Hampi. It is an interesting place to visit for tourists who are eager to see various aspects of the Vijayanagara architecture. The Inscribed Vishnu Temple dates back to the period of the Vijayanagara Empire. As the name indicates, the temple is dedicated to the Hindu deity, Lord Vishnu. Though it is in a ruined condition now, the remnants of the temple signify that it was a beautiful temple during the days of the Vijayanagara Empire. The Inscribed Vishnu Temple portrays the typical Vijayanagara style of architecture. An interesting fact about the temple is that it displays several rows of inscriptions. These inscriptions are carved on stone and can be seen on the outer walls of the temple. Due to the presence of the numerous inscriptions on the walls, the temple came to be known as the Inscribed Vishnu Temple. The temple, like many other structures in Hampi, is a remarkable example of fine architecture. The main temple is situated within an enclosure or walled compound. The temple structure is similar to the structure seen in most South Indian temples and consists of a Garbagriha, an Antarala and a Maha Mantapa. There are four central columns in the outer Mantapa of the temple that are in an elevated position. The doorway of the temple’s Antarala is decorated with emblems that represent features related to the Hindu mythology and Lord Vishnu. The temple complex also has a basement of a ruined structure that is situated in the northern part of the enclosed area. The temple has simple external surfaces, but the pillars are richly decorated. Carvings of lotus buds can be seen on the ornate pillar capitals. The whole temple structure is made from rectangular granite blocks, as was the common practise during the time of the Vijayanagara Empire. There is a column with a pointed octagonal shaft that is situated right outside the entrance of the temple. The Inscribed Vishnu Temple has a few unique carvings that are usually not seen in other temples of Hampi. Apart from the inscriptions on the walls of the temple, it also has a few peculiar carvings of lizards and such things on its walls. It is not known exactly why these carvings have been done on the walls of the temple. The Inscribed Vishnu Temple is a much ruined structure today. Some parts of the temple have been completely destroyed. Whatever remains of the ancient temple offers just an idea about its real beauty. Blocks of granite and half-ruined walls and columns mark the existence of the temple. Today it is just a ruined structure, like most other damaged structures and monuments of Hampi. The structure reminds visitors that another beautiful piece of architecture has been lost in Hampi due to the destruction caused by men and time. 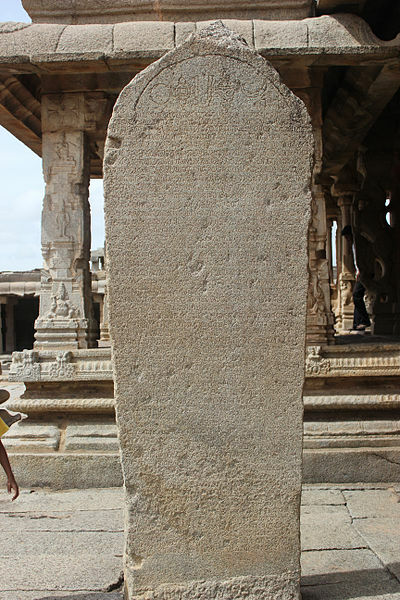 The Inscribed Vishnu Temple is not far from the Vittala Temple or the banks of the River Tungabhadra in Hampi. The place can be easily reached by vehicles from all parts of Hampi. Hampi has no airport of its own and so, cannot be reached directly by flight. Ballari (Bellary) is the nearest town to have an airport. Ballary is situated at a distance of around 64 km from Hampi. Visitors can reach Ballari by means of flight and then travel to Hampi by local transport. Hampi cannot be reached directly by train as it does not have a railway station. The nearest railway station is situated in Hosapete (Hospet). The Hospet Junction Railway Station in Hosapete is connected to several other towns and cities of Karnataka by means of regular trains. Hosapete is situated at a distance of around 10 km from Hampi. One of the easiest ways to reach Hampi from Hosapete is by taking a bus. Some other means of local transport are also available to reach Hampi from Hosapete. Hampi has a good road network and is connected to many towns and cities in Karnataka through this network. There are a lot of government and private buses that travel between Hampi and several towns and cities in the state. Visitors can also hire private cars, cabs or other vehicles from Mysuru (Mysore) or Bengaluru (Bangalore).